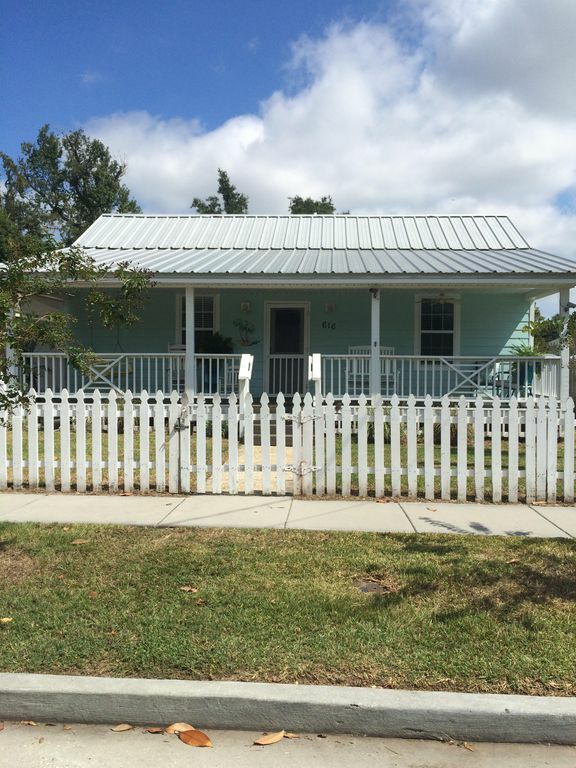 Newly renovated 3 bedroom, 2 bath home, first house from the beach! Feel the Gulf breeze while sitting on the large front porch. Enjoy the swing or many rockers. The master bedroom has a king bed and 32" TV, 2nd bedroom has a queen, 3rd bedroom has a twin over double bunkbed. There is a pull out sofa in the living room. It is equipped with a 42" TV and DVD. The large back yard is privacy fenced. Enjoy the large back deck while barbecuing. Just minutes from downtown restaurants and nightlife. One mile from Islandview Casino. This house was our original family home where we made many wonderful memories.We recently purchased another home because of our enlarging family. Our family has 7 other vacation homes in the area and this one will quickly become the favorite. We bought this great cottage because of the wonderful location. The beach view while swinging on the front porch is so relaxing. Mississippi Gulf from the front porch swing. This house was exactly as described. It was clean and neat and attractively furnished. There was a large fenced backyard for our two Golden Retrievers to have plenty of room to roam and explore. The kitchen was updated, functioned really well, and was well-equipped. TVs were modern and large screen. Most of all, I think the location was a huge benefit to renting this house. It was located a block from the Gulf of Mexico, a mile from a casino, 15 minutes from Biloxi casinos, and two miles from a really nice restaurant in Gulfport. My only issue is that it could stand some paint refreshing in some places, like the baseboards in master bath, picket fence. Overall, we were pleased with our little trip, and found the owner of this house very easy to work with. The property fit our Christmas holiday plans very well, my son drove in from Houston and I drove down from just south of Nashville. The neighbors were friendly and the house was quite comfortable for our needs. I am so glad y’all had a great Christmas at the Gulfbreeze Getaway and were able to make lasting family memories. The cottage is in a really great location--it's just a few blocks back from the beach, and there are sidewalks on the street so it is a great place to walk your pups. We really enjoyed the front porch for working and relaxing. Overall, though, there were quite a few things that need updating. The entire property is fenced, which is great. However, the fence is badly in need of repairs. Our dogs got out by pushing through a rotting board on Thanksgiving and a neighbor called the police (who, thankfully, did not come). Everything turned out okay, but after that we didn't feel comfortable leaving our pups alone. Some dogs might be okay in that environment--it just didn't work for us. We also found that the bed in the king-sized room was unbearable to sleep on and we ended up sleeping in the smaller, queen-sized bed. This one was pretty comfortable and we appreciated having the option. Thanks for the review. The king size bed and the fence have been fixed. I’d be eager to fix the other quirks if I knew what they were. We are courteous enough to allow pets to stay at our property, although they make our cleaner’s job harder. Pets are the responsibility of the owner during your stay at The Gulf Breeze Getaway. We are always a phone call away. If there is an issue during your stay, please let us know so we can remedy it as soon as possible while you are still visiting. Wonderful place to stay. Easy in and out plus it’s quiet. Dogs had a great time too! Would have been 5 stars but washer and dryer need to be replaced. Will come again! We had our son, daughter and their families and the house was perfect. That back yard is awesome. Easily slept the 8 of us and our Yorkie loved it. Great location. Thanks, Vickie, for a wonderful time. We'll surely return. Lovely place and a short walk to a beach. The house is decorated so nicely. It is a short drive to casinos. If you have your own chairs and umbrellas, there is a nice beach a short walk from the house. Bring your beach towels. The neighborhood is peaceful and the neighbors are nice. Kitchen is equipped. We would stay again. Enjoy 26 miles of public beaches with plenty of free parking. Visit the many restaurants, shopping, antiquing, museums, festivals and Crusin' the Coast.